You are browsing the archive for 2018 February 12. 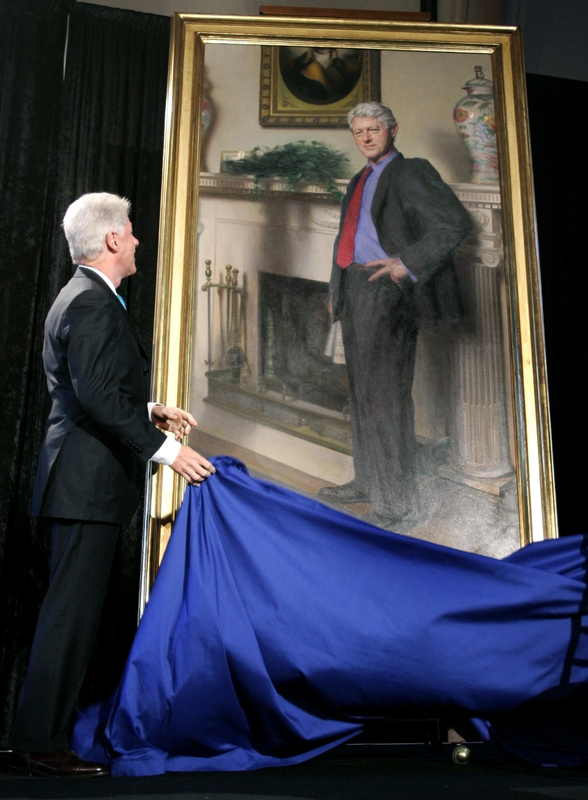 It may be the age of the photo selfie, but with the recent unveiling of the presidential portrait of Barack Obama at the National Portrait Gallery in Washington, Americans are again reminded that official renderings of our top leaders tend to come in the most traditional of forms: oil paintings on canvas, displayed inside a fancy frame. As a group, the 44 images to date hew pretty closely to the venerable tradition of power portraits—think kings and popes through the ages. There are the obligatory somber backdrops, the stiff, dignified poses and occasional props, like a globe, a book or some important-looking papers. Only a handful of artists have broken from such traditional stylings. And a few have embedded pointed symbolism. Not all presidents were happy with the results. When choosing artists to paint their portraits, President Barack Obama and his wife Michelle expressed the importance of having African-American painters create the images. 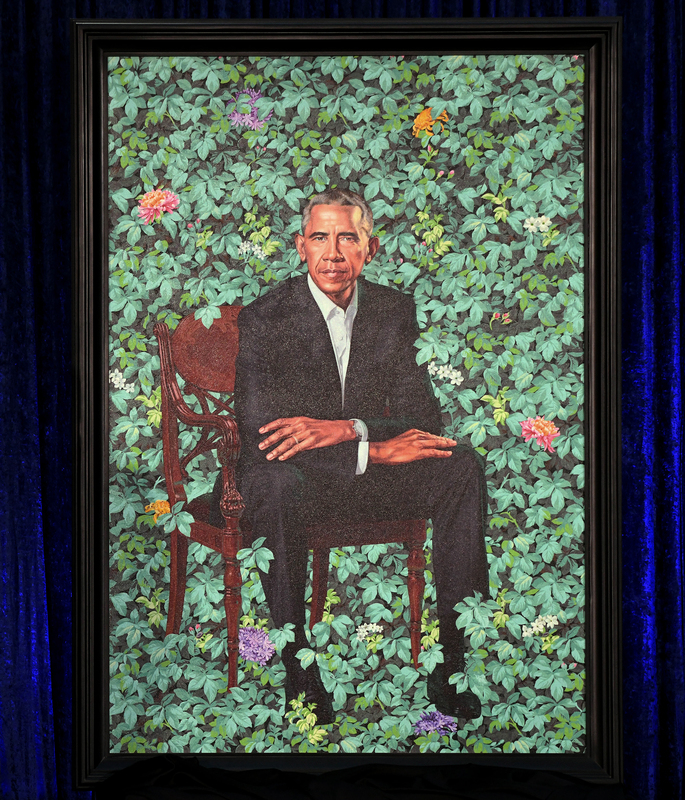 Mr. Obama chose painter Kehinde Wiley, known for stylized portraits that address the politics of race, saying he admired the “degree to which [the paintings] challenge our conventional views of power and privilege.” Wiley says the lush, leafy background imagery he chose for the portrait was a way of symbolically “charting [Obama’s] path on Earth,” including African blue lilies for Kenya, for his father’s heritage; jasmine for Hawaii, where the former president was born; and chrysanthemums, the official flower of Chicago. 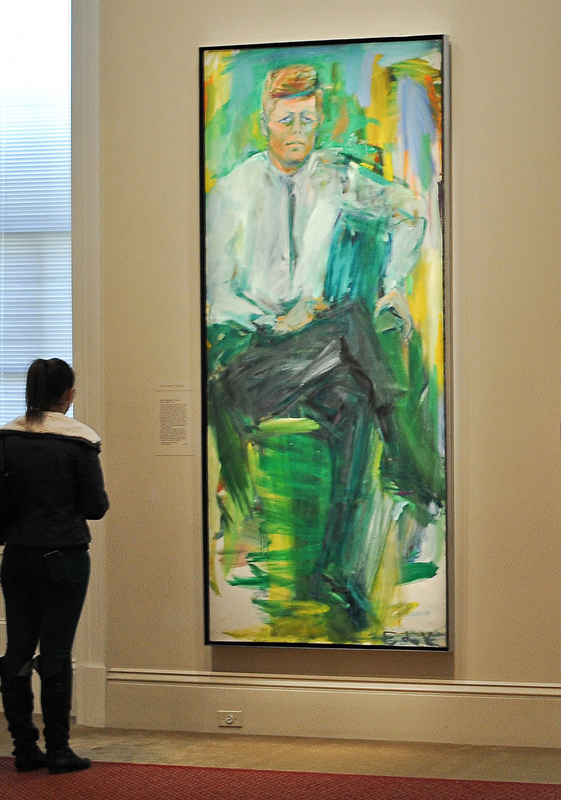 Prior to the unveiling of Kehinde Wiley’s canvas of Barack Obama, this image of President Kennedy, painted by abstract artist Elaine de Kooning, was arguably the most modernist rendering of all the official presidential portraits. Kennedy sat for the portrait in his Palm Beach estate in December 1962, a location reflected in the sunny shades of yellow, aqua and green. A new nonprofit devoted to healthcare solutions exposes a glaring lack of vision. It's a little surprising, then, that the organization's board of directors includes so many prominent politicians. In addition to Slavitt, there are former governors Steve Bashear (D-KY) and Jim Douglas of Vermont (R-VT), along with erstwhile United States senators Dave Durenberger (R-MN) and Bill Frist (R-TN). During his four years as Senate majority leader, one of Frist's major initiatives was the privatization of Medicare. It should go without saying that “healthcare over politics” is a platitude, one reminiscent of the now-irrelevant and soon-to-be-forgotten “No Labels” movement. These groups are not nonpartisan but bipartisan, and their goals and solutions are driven as much by ideology as those who push for single-player on the left. As the last 10 years have made abundantly clear, health care is politics, and pretending otherwise is its own form of political choice. Because of the fact that the language is vague in pretty much every way except on these last two points—that healthcare solutions must be politically feasible, an oft-heard criticism of single-payer from the center, and that they can’t be fiscally “irresponsible,” the usual charge against Medicare for All from the right—the assumption of many on the left is that the group’s intent is to head off the growing popularity of universal healthcare in favor of less radical, more consensus-driven solutions. Lauri Love could face solitary confinement and placement on suicide watch if sent to the U.S. The extradition case of Lauri Love, the alleged hacker currently in the United Kingdom, is placing a spotlight on the detrimental prison conditions in the United States. On February 5, a British High Court decided in favor of Love in his appeal to remain in the UK, due to concerns over the physical and mental treatment of those incarcerated in American prisons. An expert report from Simon Baron-Cohen which is cited in the High Court’s ruling, states that Love’s health conditions make him “much more high-risk than prisoners who only suffer from one of these conditions.” Love might face solitary confinement and placement on suicide watch. As experts cited in the ruling describe, U.S. prisons are ill-equipped to provide mental health services to inmates. Not only do prison services fail to provide necessary support, studies indicate they actually make the problems worse. A study on solitary confinement and mental illness found that for those in solitary confinement with mental illness “the conditions … can exacerbate their symptoms or provoke recurrence,” according to The Intercept. While speaking to the BBC, Love highlighted the difference in sentencing length being sought between the U.S. and the UK. “You don’t have any hope when you’re thinking of spending the rest of your life in prison in less than humane conditions,” Love said. A new report reveals troubling facts about the latest wave of right-wing extremism. In the 20th century, the advocates of free-market economics almost invariably pin the blame for government intervention solely on erroneous ideas — that is, on incorrect ideas about which policies will advance the public weal. To most of these writers, any such concept as “ruling class” sounds impossibly Marxist. In short, what they are really saying is that there are no irreconcilable conflicts of class or group interest in human history, that everyone’s interests are always compatible, and that therefore any political clashes can only stem from misapprehensions of this common interest. At the opening ceremonies of the XXIII Olympic Winter Games, on February 9, 2018, something spectacular happened: Athletes from North and South Korea, which have been bitterly divided for 73 years, marched beneath a unified flag. Though North and South appear no closer to reunification, the move was seen as an olive branch of sorts that could pave the way for better relations between the estranged countries—and it’s just one example of how the worldwide sporting event can bring people together, if only for a few weeks. It’s not the first time a divided nation has come together as one Olympic team. From 1956 through 1964, East and West Germany unified as a single team—until heightened political tensions tore the athletic programs apart. 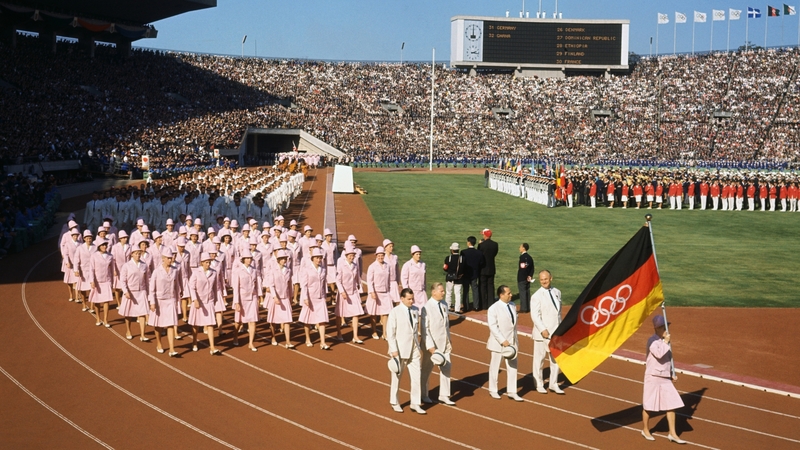 At the end of World War II, the Olympics couldn’t be further from the minds of the German people. 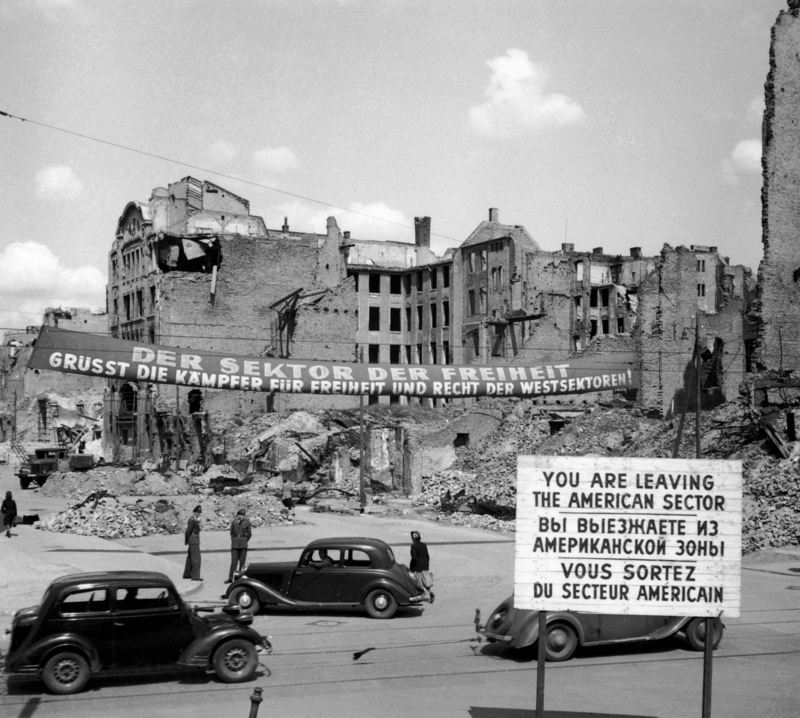 Their country had been decimated during the war, and in 1945, after Germany surrendered, the Allies split the country into four occupation zones. There was work to do: Not only did the Allies endeavor to root out Nazism from the remaining population, they also had to deal with millions of displaced persons, whose homes and families had been destroyed during the war and the Holocaust, and stabilize Germany’s collapsed economy. In 1949, the western Allies—France, the United Kingdom and the United States—allowed their zones to self-govern, and the Federal Republic of Germany was born. Meanwhile, the USSR took over the eastern half of Germany and created the German Democratic Republic, a communist state. As daily life slowly normalized, both nations, which had been banned from competing in the 1948 games, began to look forward to the Olympic Games of 1952, 1956 and beyond. The Trump administration is tearing families apart. Berrones, a furniture upholsterer and air conditioning maintenance worker, lives in Phoenix and has been in the United States since he was about 18 months old, [attorney Garrett] Wilkes told The Arizona Republic. Berrones first fell onto Immigration and Custom Enforcement’s (ICE) radar in 2006 for driving with a fake driver’s license and deported to Mexico. Desperate to reunite with his family, Berrones twice reentered the U.S. without permission. When he again faced deportation in 2016, he was able to get a stay of deportation based on humanitarian factors—Jayden’s illness—and was granted a work permit. But following Donald Trump’s inauguration, Berrones was told during an ICE meeting in June that he would need to check in more frequently. By December, he was told to prepare for deportation. Donald Trump’s possible decision to end NASA’s funding of the International Space Station by 2025 brings up that age-old question of the proper role of government, although it is certainly not he who is bringing it up. NASA and the space agencies of Russia, Japan, Europe and Canada have hosted investigators from 83 nations to conduct over 1700 investigations in the long-term micro-gravity environment on-board the ISS. Many investigators have published their findings and others are incorporating findings into follow-on investigations on the ground and onboard. Their research in the areas of earth and space science, biology, human physiology, physical sciences, and technology demonstration will bring yet to be discovered benefits to humankind and prepare us for our journey beyond low Earth orbit. The first of many components of the ISS was launched into orbit in November 1998. Assembly was completed in July 2011. The station has been continuously occupied by a maximum of six astronauts from various countries since November 2000. The ISS has a mass of 410,501 kg (905,000 lbs) and a pressurized volume of approximately 916 m3 (32,333 ft3). The ISS can generate up to 80 kilowatts of electrical power per orbit from solar arrays which cover an approximate area of 2,997 m2 (32,264 ft2). The ISS structure measures 95 m (311 ft) from the P6 to S6 trusses and 59 m (193 ft) from PMA2 to the Progress docked on the aft of the Russian Service Module. The ISS orbital altitude can range from 278-460 km (150-248 nautical miles) and is in an orbital inclination of 51.6 degrees. The ISS currently houses 6 crew members. The ISS is so large it can be seen from Earth with the naked eye. It maintains an orbit between 205 and 270 miles above the Earth, and completes 15.5 orbits per day. Of course, all of this comes at a price — an enormous price to U.S. taxpayers. The owners of a family farm in northern Virginia publicly announced their opposition to white supremacy — and then responded on Facebook to the racist backlash. Cox Farms posted “resist white supremacy” on the sign in front of their Centreville destination, where they hold seasonal and holiday festivals, reported WJLA-TV. Some social media users did take offense to the farm’s sign and Facebook post, and the family painstakingly responded to critics who complained about seeing a Black Lives Matter sign there in the past but no Blue Lives Matter message. Another social media claimed the sign was divisive and forced “black supremacy” viewports on passersby — which the family explained was illogical. Not all Facebook users reacted negatively to the family’s message. “If you see a sign that says ‘resist white supremacy’ and you first instinct is ‘well, I’m never shopping THERE again!’, guess what? You’re part of the reason signs like that need to exist. You ARE the problem,” said Facebook user Bryan Proctor Jr.
policymakers are considering funding public schools equitably. funding as their traditional counterparts. return-on-investment than their neighboring district schools. child’s K-12 education in district schools. for each charter school student in Atlanta. likely to become pregnant as teenagers.